Priority Matrix gantt chart software makes it easy to visualize project timelines, track team progress, and collaborate like never before. Why Use Gantt Chart Software? Gantt charts provide many benefits to teams, both traditional and remote alike. Primarily, using a Gantt chart provides team members with a visual outline of the project timeline. This not only ensures that your team stays on the same page, but also makes it easy to keep projects on track. Secondly, Gantt charts provide a critical path for teams to follow. Have you ever walked into the office and thought, "where should I start today?" When your team uses Gantt chart software, all it takes is a glance at the program to answer your question. Priority Matrix Gantt charts allow you to create visual project schedules. Watch your team productivity soar with shared Gantt charts that keep everyone on the same page. With Priority Matrix, Gantt Charts can be shared or kept private. Share projects with your team for maximum efficiency, or keep projects private. Our information is encrypted both in-transit and at rest. Use our in-app chat and simple delegation features to ensure effective communication within your team. With Priority Matrix, you'll never lose track of an important task. A Gantt Chart is a timeline view of a project used to visualize project timelines, organize complex projects & tasks, and keep teams on track. Gantt charts are named after Henry Gantt, who developed this type of chart in order to outline project schedules. Creating a Gantt chart in Priority Matrix is as easy as 1, 2, 3! 3. Determine who is responsible for each task, and delegate away. Our Gantt chart software reads the information from your projects and creates a Gantt chart for you. Changes to your tasks and projects are reflected in real time on the Gantt chart. What's more, you can visually drag and drop tasks to rearrange project timelines. What's more, you can create online Gantt charts from anywhere using Priority Matrix. Our app works on iOS / Windows / Web / Mobile, and even offline. After determining your task and project timelines, using the Gantt chart in Priority Matrix allows you to track progress project, make sure the project is following the correct timeline, and ultimately, work more effectively. Use our Gantt chart tool in concordance with our intuitive project and team reporting capabilities to watch your productivity soar. Don't forget, you can drag and drop tasks directly within the Priority Matrix Gantt chart for even easier team updates. And don't be shy! Dive into the in-app chat to let your team know your thoughts on their great work. For more information on using our Gantt chart, see here. Gantt Chart Software is a tool that enables you to create Gantt charts to visualize project timelines. However, simple Gantt software often lacks core capabilities that collaborative teams require, such as the ability to share files, view tasks on a calendar, and delegate work from one team member to another. Project management software is a more well-rounded solution, as it includes Gantt charts, along with providing the other functionalities your team needs to reach their full potential. 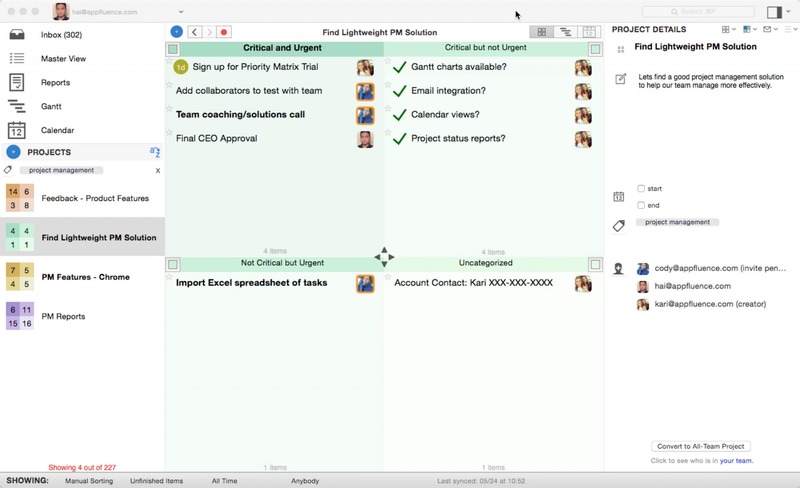 Priority Matrix is a lightweight project management solution that allows managers to achieve more visibility and accountability within their teams. 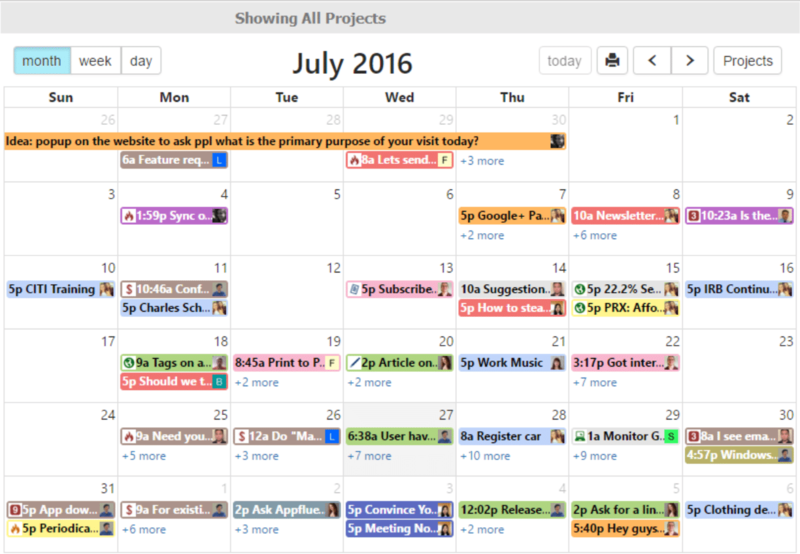 Along with Gantt charts, Priority Matrix provides a built-in calendar, integration with Outlook, Gmail, Apple Mail, Evernote, Google Docs and more. Priority Matrix is the perfect easy-to-use tool for non-project managers and project managers alike. Priority Matrix Gantt allows you to upload resources to tasks. Before assigning a task to a team member, make sure you have included the resources needed for that person to see the task thru to completion. When you begin planning a project, rather than trying to confine the timeline of the project, estimate the duration of individual tasks, then view your project in the Gantt format. This will ensure you envision an accurate project timeline from the start. Utilize built-in communication features to communicate with your team. For example, Priority Matrix provides an in-app chat. By using the in-app chat, you can reduce email traffic and work even more efficiently. Consider your Critical Path, or order of operations. Gantt chart software helps you visualize the order in which tasks need to be completed, but only you have the critical thinking skills to make that decision. Be proactive! If you notice that a task deadline is approaching, but no progress has been made on the task, check in with whoever is responsible for it. Acting before the task is overdue will ensure your project stays on track. How to Create a Gantt Chart in Excel (and how to save time doing so): creating a Gantt chart in Excel is a complex process. Learn how you can save time with Gantt chart software! Critical Path Method: what is Critical Path? How can using a Gantt chart help you determine yours? More on Gantt Charts, wiki: from the history of Gantt charts to a list of Gantt chart software, this page has it all. 6 Gantt Chart Software Tools: if a project management solution is too robust for you, consider these simple options.